Over millions of years the river Rhine has carved its riverbed deeply into the slate mountain range to pass those obstacles on the way to the North Sea. Due to the hard rocks of this mountain range the river does not flow straight, as passing or permeating through the rocks proved an almost hopeless task for the water in many places. Instead, the Rhine was forced to use every weakness of the stone to make its way. Shortly after Oberwesel the riverbed gets very narrow, as it is squeezed to half of its original width here. As a result, the water flows more quickly to allow the normal quantity through. 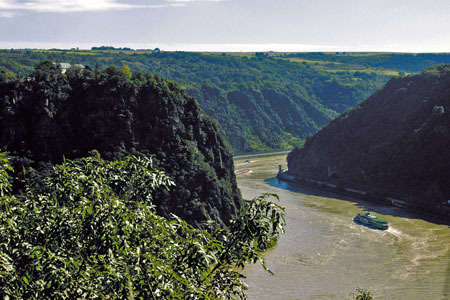 Furthermore, the massive rocks force the river to flow in an S-curve here, and on the second bend of that S-curve is the Loreley rock, a rock that has fatally determined the fate of many sailors. This is partly due to the difficult shipping conditions here, but also because legend tells us that here a beautiful young woman combed her long blond hair with a golden comb, and her singing enchanted the sailors so much that their ships crashed on the rock. It comes as no surprise, then, that this legend has made the Loreley,together with the fortress ruins and medieval towns of the Middle Rhine, a symbol of the "romantic Rhine". Heinrich Heine's poem about a beautiful virgin named Loreley, set to music by Friedrich Silcher, has even become known as a folklore song. Nowadays thousands of visitors come here from all over the world to experience the unique landscape (a UNESCO World Heritage site) which is best appreciated on a "romantic" boat trip.